Bringing in a rent freeze and rent control. The groups also want the City to build 100% welfare rate ($375) social housing at 58 W. Hastings St, a site owned by Vancouver Housing Authority. 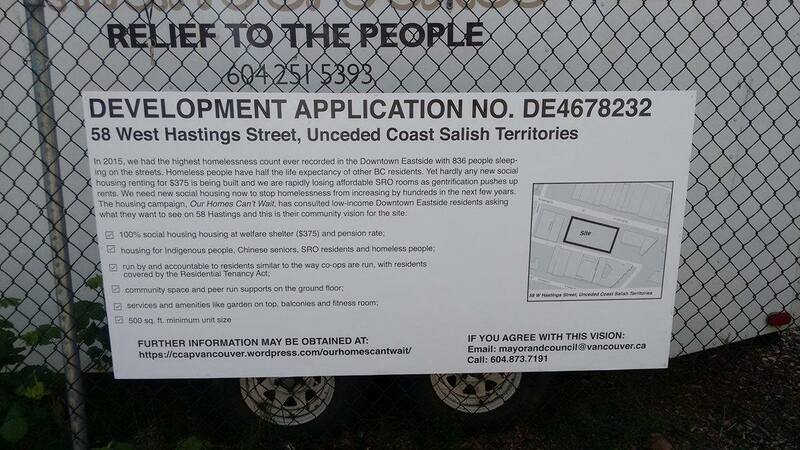 To reinforce their demand they erected a development permit sign with their community vision for the sign (photo attached). The City is currently planning to build a social mix rental project on the site, with only 15% of the units going towards SRO tenants on income assistance. “We need social housing in this area,” said DTES resident Herb Varley. “Housing affordable to people on welfare and pension.” Joanne Shaw, another DTES resident, said, “We need rent control for the unit, not the tenant.” Shaw explained how landords evict tenants and then raise the rents to $1000 and even $1500 a month for a little room. The community campaign, called Our Homes Can`t Wait, was also endorsed by the 300 strong Western Aboriginal Harm Reduction Society, Vancouver Area Network of Drug Users with 3000 members, Carnegie Community Centre Association with 500 members, the Downtown Eastside Women’s Centre which serves 400-500 people a day and the DTES neighbourhood house which serves about 400 people a week. King-mong Chan from the Chinatown Action Group also spoke in favor of the campaign as did DJ Larkin, a lawyer from Pivot Legal Society. Larkin said the “need is urgent for more housing” and that these measures are bare minimum and necessary to stave off the housing crisis. “As UN Special Rapporteur on the right to housing, like my predecessor, I am deeply alarmed by the housing conditions for those living in the Downtown Eastside (DTES) of Vancouver. The prevalence of homelessness is an obvious symptom of structural inequality and a failure to effectively implement the right to housing, an obligation which extends to the City of Vancouver, the province of British Columbia and the Government of Canada. There is a clear and obvious connection between inadequate social assistance rates, poor housing and homelessness. It is important for all levels of government to work together along with the community and persons experiencing homelessness or housing inequality to discuss and create sustainable solutions to address this human rights crisis.